Traditional Sankheda furniture of Gujarat have a royal history dating back to centuries. Sankheda furniture is known for its captivating art and longevity without decaying. These furniture have gained popularity among many countries in the world. Sankheda furniture is considered auspicious and is used in many religious and festive occasions. The various uses include sacred pedestals for idols in temples, chairs for the bride and groom in weddings, to cradles and walkers for infants and garden swings. 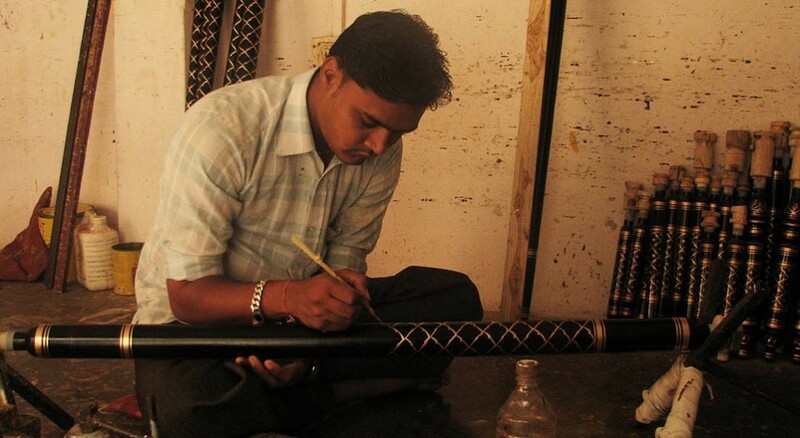 The process of making the Sankheda furniture requires a lot of patience and effort. The individual components of the furniture piece are made by turning the teak wood on a lathe, which is done manually, with the help of a hand held bow. Sheets of tinfoil are pounded along with hot saras or glue till the two become a homogenous mass which dissolves easily in water. This is harkalai, which is used to paint intricate floral and geometric patterns while turning the member. The craftsman, with great mastery of skill and geometric precision, maps the ornamental patterns free-hand, matching them perfectly, without any measurements. To enhance the lustre of the painted motifs, agate stone is rubbed over the wood. Clear lac, when applied to the wood a glowing orange colour. Finally, kevda leaf is used for final finish and gloss. All the components are then assembled together with wood joinery into a single furniture piece. But the furniture pieces painted with natural lac are incomparable in aesthetic value, with the ones painted with synthetic colours, as lac gives a certain depth and natural glow to the piece, while synthetic paint appears flat. There are 10-15 master craftsmen in Sankheda, who know all the processes. Others are proficient in only one process and depend on other craftsmen involved in different processes. 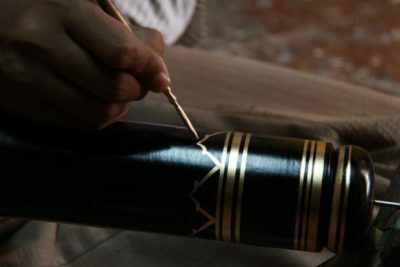 For example; while some master wood-turning skills, others attain expertise in painting the patterns. This creates a relationship of inter-dependency and collective identity.The skill of the master craftsmen ensures uniformity in creating identical pieces that fit together to form pieces of furniture. It is a testimony to the dexterity of the craftsman’s expert hands, considering that no two handicraft objects are alike. A craft tradition so deeply inherent in the collective identity of the practitioners, that their town is named after it. Sankheda, a small town in the eastern region of Gujarat derives its name from ‘sanghedu’, the word for a lathe in the Gujarati language. 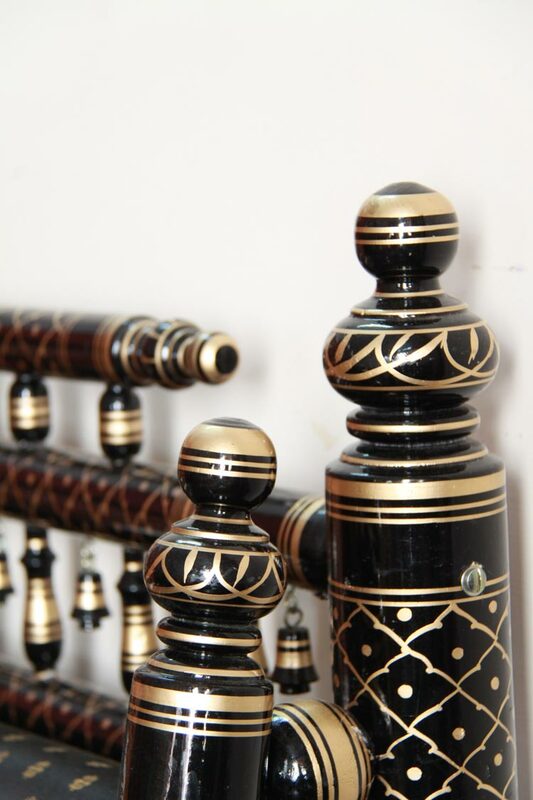 Lacquered turned wood furniture with hand painted motifs and traditional method of ornamentation, popularly known as Sankheda furniture, is thought to have been produced here from about 1855. In this town, about 80-100 families belonging to the “Kharadi-Suthar”community are involved in this craft, giving them a strong sense of community identity and continuity. Every year, on the ‘Maha sud Teras’ day in February, the entire ‘Kahardi-Suthar‘ community, along with the ‘Sonis’ (jewellers), ‘Luhars’(metal workers) and ‘Kumbhars’(potters) come together to worship Lord Vishwakarma, the presiding Hindu deity of all craftsmen and architects, and celebrate and pray for the well-being of the community and the progress of their craft. The craft is greatly respected in the region. 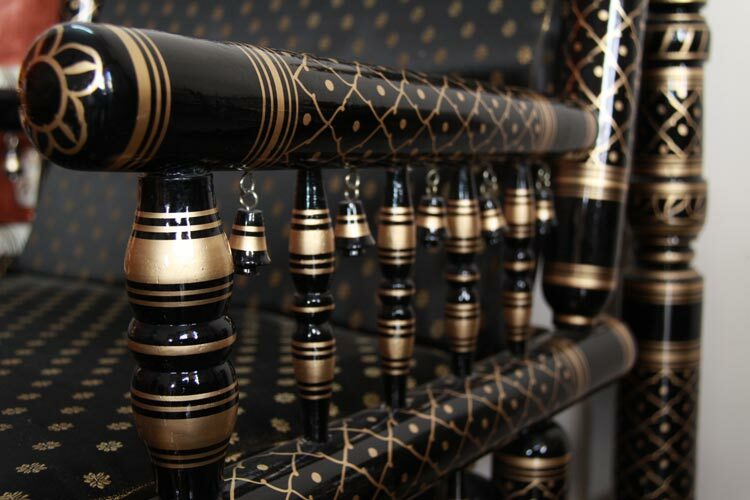 Ghodiyun‘ (child’s cradle) is believed to be one of the first furniture items produced using this form of expression. It is a prized possession in Gujarati families, and is passed down through the generations as an heirloom. The erstwhile Gujarati royalty have in the past gifted it to royalty and state-heads of other countries. Today, the craftsmen set up motorised machines, as per their requirements, to turn the lathe. The use of synthetic colours and melamine coating instead of natural colours and lacquer has also become common. This is an amazing drive. I got to see the products which are made by our remarkable craftsmen. The beauty of creativity in every corner of this gifted country is awesome. Loved the concept of creating one roof for all the artisans and connecting them to their desired buyers.